Lighting needs to bring a sense of ambience and beauty to your home in a way that makes everyone fall in love with it. Hubbardton Forge sconces can do that. The name sounds historic and romantic in a way that is appealing to all tastes. Hubbardton Forge lighting can pull all the lighting together, making your home look beautiful and combining a sense of the historical with the rustic, wrought iron beauty that is just what you are looking for. What is a sconce, exactly? A sconce is a light fixture that is attached to the wall, and that feature already sets them apart as something different today. 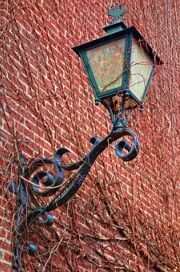 Originally, a sconce was a holder for candles, oil lamps, or gas torches, so it needed to be strong, well made, and capable of withstanding high heat. Today, they stay in one place and hold lamp shades and light bulbs, but they are still both within reach and out of the way. Hubbardton Forge sconces (http://blog.crescentharbor.com/light-home-touch-luxury-hubbardton-forge-sconces/) bring light to difficult spaces and are flexible enough to be used everywhere. Sconces provide evenly spaced light, in single or in multiple. Put a sconce in an area where you want just a small amount of light, or place several sconces an evenly spaced distance apart from each other to bring in the idea of illumination that travels with you throughout the home. Hubbardton Forge sconces can give all the areas of the home a sense of unity and planned flexibility. Hubbardton Forge sconces provide flexibility because they are adjustable. They point their light either up or down. What’s the difference? Directing lighting up by pointing the shade on a wall sconce upwards adds depth to a small space like a bath, and it gives it a soft, glowing ambience. The light reflects off the ceiling and diffuses back down. Pointing the shade down, on the other hand, directs the light to a specific area and works efficiently as task lighting for a bathroom vanity mirror or for reading area or desk. The light focuses where you want it, thereby effectively illuminating the way you want it. You can use the Hubbardton Forge sconces to illuminate any area in your home. As well, you can use Hubbardton Forge matching lighting to bring that continuity, unity, and flexibility into areas where sconces work well with other types of lighting styles, like pendants, ceiling lights, chandeliers, or lamps. The lighting is flexible because of the matching selection of styles and types of lighting, so you never have to look unplanned again. Indoor or outdoor, Hubbardton Forge sconces are what you are looking for.